DEI modular pulse generators are designed as compact, economical high performance pulse generators for use in spectrometers, accelerators, radar transmitters and other equipment and instruments requiring high voltage, precision voltage pulses. Their versatile design also makes them well suited for use in laboratory and test environments, in which a benchtop or rack mount instrument may not be the optimum choice. 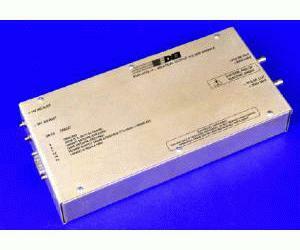 The PVM-4210 is optimized for differential drive of deflection plates for electrostatic modulation of particle beams in time-offlight mass spectrometers and accelerators. It will also drive any high impedance, capacitive load such as Pockels Cells and QSwitches, electrodes, microchannel plates, acoustic transducers, image intensifiers and photomultiplier tubes. The exceptional pulse fidelity of the PVM-4210 will optimize the performance of any system in which it is used. The module provides two pulse output channels, controlled by a common control logic. When the control logic receives a gate signal, both channels pulse simultaneously. One channel pulses from ground to the positive high voltage, and the other channel pulses from ground to the negative high voltage. Therefore each output can be connected to the electrodes of a Pockels Cell or Q-Switch, or to a pair of deflection plates, providing a 1,900V differential pulse across the cell or plates. These outputs may also be inverted, to pulse from the high voltage potential to ground. The width and frequency of the output pulses follow the width and frequency of the TTL input gate. The amplitude of the output pulse voltage for each channel is independently adjustable from 0 to 950V using screwdriver-adjustable potentiometers readily accessible on the end panel of the pulser module. Each channel is a half-bridge (totem pole) design, offering equally fast pulse rise and fall times, low power dissipation, and virtually no over-shoot, under-shoot or ringing. The unit has over-current detection and shut-down circuitry to protect the pulse generator against potential damage due to arcs and shorts in the load or interconnect cables. The PVM-4210 is a complete pulser solution with high voltage power supplies, energy storage and output network, ready for use. It can be connected directly to the load, and does not require series or shunt resistors, impedance matching networks between the pulser and the load, or additional energy storage (capacitor banks). All of this is taken care of within the PVM-4210. The pulser is housed in an aluminum enclosure, with threaded mounting holes in the base to simplify installation and assembly in OEM applications. The PVM-4210 is a direct-coupled, all solid-state design using air as the primary insulating medium. Its conservative design margin gives you long component life. And keeping the PVM-4210 free of potting compound or encapsulation materials makes it easy to service if a component ever does require replacement. Some competing products are potted, and must be replaced if they fail. But compactness and durability are not all you get in the PVM-4210. Inherent in the design is exceptional pulse fidelity with virtually no ringing, over-shoot or under-shoot, and protection against arcs, shorts and load transients in a reliable, economical module.